Thinking of ways to incorporate your beach theme into your gentlemen’s boutonnieres? 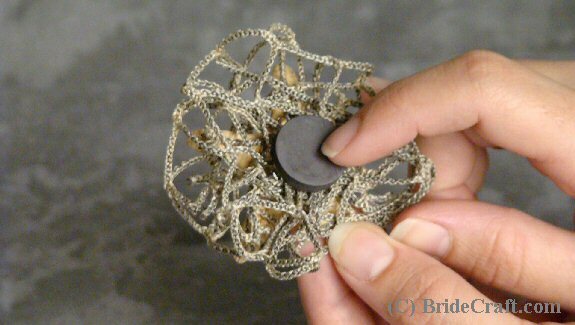 Then make this ingenious boutonniere! It’s simple, elegant and modern. Pros: This project is extremely simple. Any skill level may create it. It is also very inexpensive, and may be made MONTHS in advance. Cons: There are very few cons with this project. A word of advice, make sure you get a powerful enough magnet. 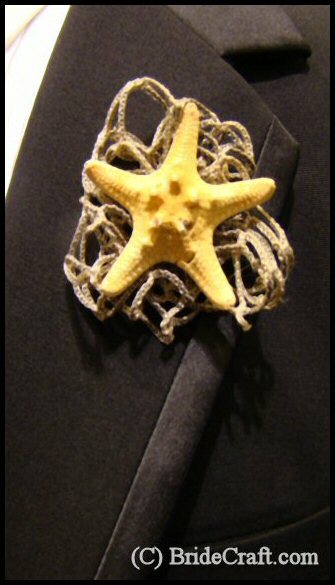 The magnet needs to be strong enough to make the starfish adhere through the lapel. 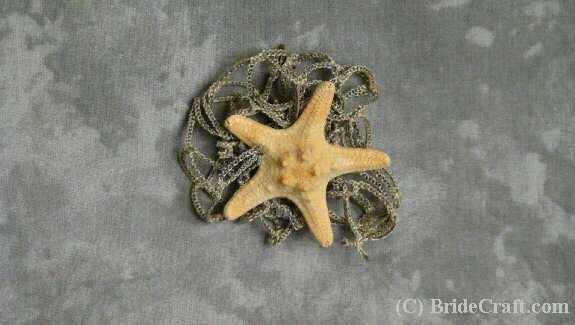 Step 1: you will need one small starfish, two craft magnets, a bit of decorative beach netting, scissors, hot glue gun and a hot glue stick. Tip: You may also use moss instead of netting for a natural effect. 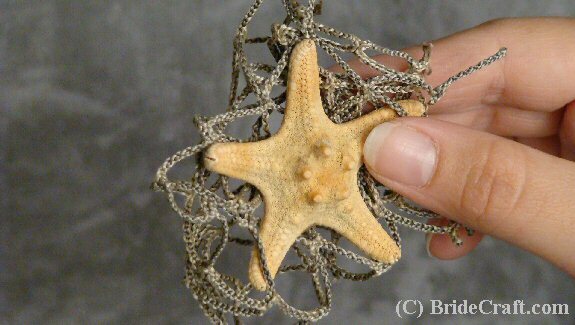 Step 2: Cut a piece of the net, and position it underneath the starfish. Make sure the net is a size and position you are happy with. 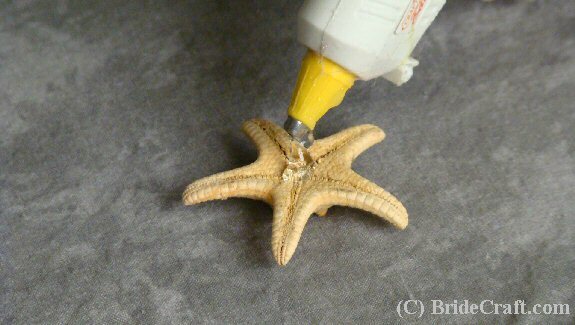 Step 3: Place a large dot of hot glue on the back of the starfish with the glue gun. 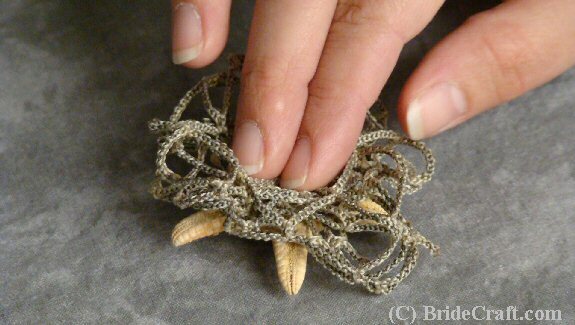 Step 4: Quickly place the netting (arranged appropriately)onto the dab of hot glue and press down. Tip: When pressing down be careful to avoid singing your fingertips. The glue is very hot. Step 5: Position a thick dab of glue on the back of the starfish and the netting. 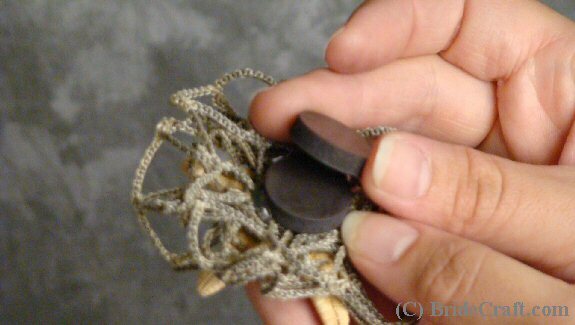 This is where you will glue the first magnet for your boutonniere. Step 6: Press the magnet down firmly into the glue. Step 7: Join the two magnets. Step 8: The end result should look something like this. Store in a clean, dry place until wedding day.